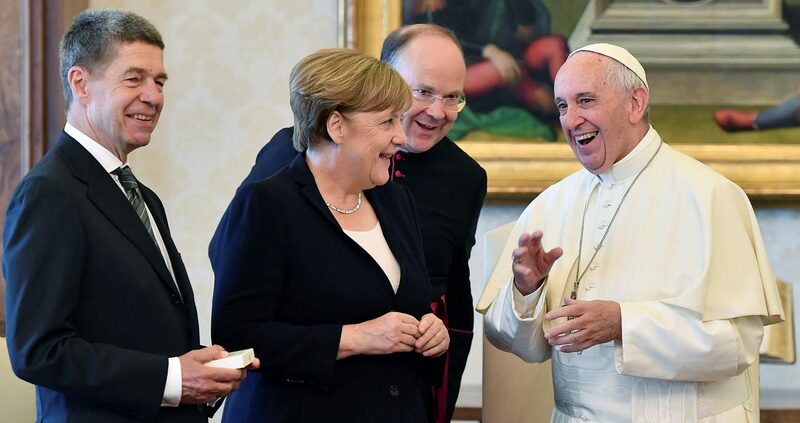 VATICAN CITY (CNS) — German Chancellor Angela Merkel said Pope Francis encouraged her to support international agreements like the Paris climate accord as well as to break down walls that divide people. The German leader’s 40-minute private audience with Pope Francis at the Vatican June 17 was the sixth time the two leaders have met. The discussions — which included a separate meeting later with Cardinal Pietro Parolin, Vatican secretary of state, and Archbishop Paul Gallagher, the Vatican foreign minister — focused on the G-20 meeting to be held in Hamburg July 7-8. “The parties agreed on the need to dedicate special attention to the responsibility of the international community in combating poverty and hunger, the global threat of terrorism and climate change,” the Vatican said in a written statement. Merkel later told reporters that she told the pope about Germany’s agenda for the G-20 meeting, which “assumes that we are a world in which we want to work together multilaterally, a world in which we don’t want to build walls but bring down walls,” she said, according to the Associated Press. She said the pope also encouraged her to support international agreements, like the 2015 Paris climate accord, which seeks to promote environmental stewardship and mitigate climate change. “We know that regrettably, the United States is leaving this accord,” Merkel said. The pope also offered the chancellor his condolences for the death June 16 of the former Chancellor Helmut Kohl. Merkel gave the pope three jars of “dulce de leche” she brought back from a recent visit to Argentina, a box of cookies and a set of classical music CDs, which included works by Ludwig van Beethoven. The pope gave her a small sculpture of an olive branch and copies in German of three of his documents: “The Joy of the Gospel”; “Amoris Laetitia” on the family; and “Laudato Si'” on the environment.